Lineup – Bobo Stenson: piano; Anders Jormin: acoustic bass; Jon Fält: drums. Swedish pianist Bobo Stenson’s musical aesthetics is all elegance and graciousness. He earned a sterling reputation while accompanying the brilliant saxophonists Charles Lloyd and Jan Garbarek, as well as trumpeter Tomasz Stanko. As a leader, Stenson gained notoriety with his classic piano trio, which went through several changes along the way. Bassist Anders Jormin replaced Arild Andersen in 1993, right after the trio’s debut, and since 2008, Jon Fält earned the drummer’s chair, replacing Paul Motian, who had stopped by in 2005, also replacing the original member Jon Christensen. Following a hiatus of six years, Stenson and his associates re-emerge with Contra La Indecision, another poetic work comprising ravishing originals (one by the bandleader, five by Jormin, and one by the collective) and world-class interpretations of compositions by Erik Satie, Bela Bartok, Silvio Rodriguez, and Frederic Mompou. 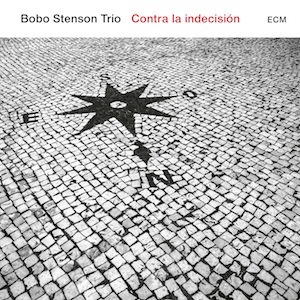 Just like it happened on Cantando (ECM, 2008), they open the album with a tune by the Cuban singer/songwriter Silvio Rodriguez, “Cancion Contra La Indecision”, which battles against the indecision with an enviable resoluteness of soft pianistic touch and tuneful melody throughout. Jormin's tunes pervade a modernistic vagrancy that is quite absorbing - “Doubt Thou The Stars” starts delicately with Fält’s fully-integrated drumming, but turns into an awe-inspiring sort of dance played in six, revealing much of the trio’s spirit; “Oktoberhavet” is a richly harmonized song advancing at a simple triple tempo; “Stilla” boasts a magnanimous bass groove that, feeling like a rock riff, is grist to the mill for Stenson’s deft interventions; and “Three Shades of a House” turns to its advantage the independence of the three instrumentalists to compose a picturesque musical setting containing bright piano notes, occasional bass harmonics and fainted arco cries, metallic clanks and scratches, and plenty of conversational cymbal flair. Whereas Stenson’s sole composition, “Alice”, was penned with relatively innocuous abstraction, featuring crying bowed bass and resolute brushwork, “Kalimba Impressions” is a short collective improvisation with a nice percussive flow. Contrasting elements within a body of work can be extremely valuable and Stenson opted to deliver the Slovak folk song “Wedding Song From Poniky” by Bartok with an introductory rubato feel, subsequently throwing in some dramatic jolts on the lower register to shake the free-floating romanticism and dreamy classical intonations of the tune. They render Satie’s “Élégie” with a blossoming vernal atmosphere and Mompou’s “Cancion Y Danza VI”, taken from Cançons I Danses collection, with intimate lyricism and ultimately groovy propulsion set off by Jormin. Avoiding standards in his repertoire, Stenson displays the highly developed language that has been characterizing his cultivated playing throughout all these years. He also evinces a distinctive complicity with his trio mates, which obviously has positive repercussions in their sound. And how they seemed to have fun riding these sonic waves!